You might have noticed that this game has gotten a lot of talk on our website recently - Walter's excelllent strategy article actually created a run on our website! So it comes as no surprise that this game is also our 'game of the month', because everybody of our group who played it liked it instantly. 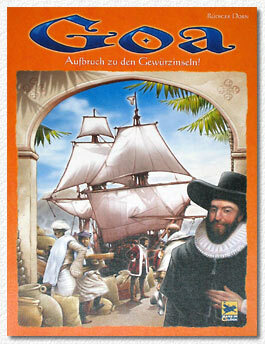 'Empire Building' games belong to our favourites - 'Goa' uses mechanics which allow interaction (through the bidding rounds), but also leave the fate of each player in their own hands in the long run. It is certainly necessary to 'have a plan' and to do the most with your limited resources. Positively received was also the fact that the game is devoid of any 'kingmakering' and the usual unfair event cards a la 'With this card you destroy/steal XXXX from any fellow player'. Although it should be mentioned that this game will mostly be liked by gaming 'geeks' (others might find it a bit dry), it will certainly satisfy anyone who likes well designed games.